A Bit of Quantum Logic-What Did the Atom Say to the Quantum Dot? “Let’s talk! Scientists demonstrate coherent coupling between a quantum dot and a donor atom in silicon, vital for moving information inside quantum computers. Quantum computers could tackle problems that current supercomputers can’t. Quantum computers rely on quantum bits, or “qubits.” Current computers perform millions of calculations, one after the other. Qubit coupling allows quantum computers to perform them all at the same time. Qubits could store the data that add up to bank accounts and medical records. In an unusual twist, qubits represent data by the binary state of electron spins. Two systems existed to create qubits. 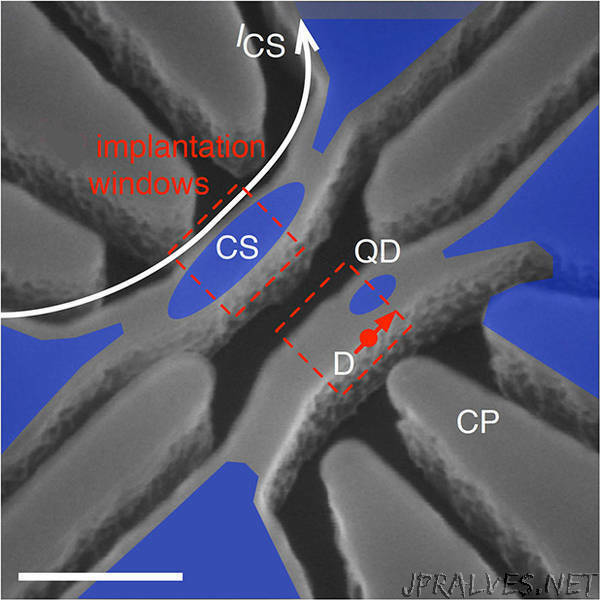 Researchers successfully integrated the systems—donor atoms and quantum dots. The new qubits don’t let the spins, and hence the data, degrade. Specifically, the bits demonstrate coherent coupling of the electron spins. This hybrid approach, which has remained elusive until now, exploits the advantages of the two qubit systems. For almost two decades, scientists have created theoretical proposals of such a hybrid qubit (donor qubit) architecture. Now, researchers have made an important step toward the practical realization of silicon qubits. Silicon matters. Why? It is the same material used today in our personal computers. The manufacturing process for qubits could fit within today’s manufacturing and computing technologies.